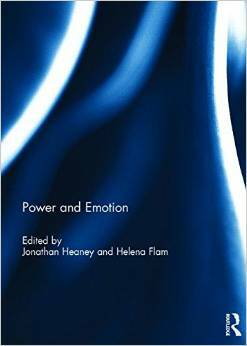 I am delighted to announce that a collection of papers edited by myself and Prof. Helena Flam on the theme of emotions and power is just out today. This collection originally appeared as a special issue of the Journal of Political Power in 2013, but was chosen by Routledge to be reissued as part of their ‘special issue as book‘ series. It is available for purchase from Amazon (UK now, US in October), Routledge, the Book Depository and elsewhere, but would make an excellent addition to your institutional library (recommendation form here). The book includes some very high quality chapters that deploy and interrogate the concepts of emotion and power across a wide array of topics and issues, from some of the leading international researchers on these topics. The quality and diversity on show recommend this publication to a variety scholars, but especially those interested in the sociology of emotions, questions of social and political power, political sociology, organization studies, media studies, education, and political and social theory more generally. Heaney, J.G. ‘Emotions and power: a bifocal prescription to cure theoretical myopia’. Flam, H. ‘The transnational movement for Truth, Justice and Reconciliation as an emotional (rule) regime?’. Simpson, A.V., Clegg, S.R., Freeder, D. ‘Compassion, power and organization’. Barbalet, J., Qi, X. ‘The paradox of power: conceptions of power and the relations of reason and emotion in European and Chinese culture’. Wettergren, Å., Jansson, A.‘Emotions, power and space in the discourse of “People of the Real World”’. Baker, S.A., Rowe, D. ‘The power of popular publicity: new social media and the affective dynamics of the sport racism scandal’. Martin, J.‘A feeling for democracy? Rhetoric, power and the emotions’. Zembylas, M.‘Memorial ceremonies in schools: analyzing the entanglement of emotions and power’. Procter, L. ‘Emotions, power and schooling: the socialisation of “angry boys”. This collection is concerned with two fundamental concepts of social science– power and emotion. Power permeates all human relationships and is constitutive of social, economic, and political life. It stands at the centre of social and political theorizing, and its study has enriched scholarship within a wide range of disciplines, including sociology, political science, philosophy, and anthropology. The conceptual cluster of emotion, by contrast, had a more troubled time within these same disciplines. However, since the 1970’s and the advent of the ‘emotional turn’, there has been a widespread re-evaluation of emotion in and for our shared social existence and, today, emotions research is at forefront of contemporary social science. Yet, although both concepts are now widely seen as fundamental, research on these two phenomena has tended to run in parallel. This collection, featuring leading international scholars, seeks to unite and deploy both concepts, emotion and power, in a variety of ways, and on a diverse array of topics such as: education, organizations, social movements, politics, ‘old’ and ‘new’ media, rhetoric and in comparative intellectual history. The results are at the bleeding edge of scholarship on these concepts, and will make important reading for practitioners and students working in the sociology of emotions, social and political power, political sociology, organization studies, and for sociological and political theory more generally. This book was published as a special issue of the Journal of Political Power. Just a quick note to announce that a special issue of the Journal of Political Power, edited by myself and Prof. Helena Flam, is now available online. The theme of the special issue is emotions and power, and the issue contains some new and exciting social science research addressing these two concepts from a variety of perspectives. We have chosen eight papers that address both concepts, emotion and power in a variety of settings, including education, work organizations, social movements, politics, ‘old’ and ‘new’ media, rhetoric and in comparisons in the conceptualization of some core concepts between ‘the West’ and ‘the East’. The diversity of subjects and approaches in evidence in the papers testifies both to the ubiquity of power and emotions in all areas of social life in general, and the importance and illumination gained from exploring these concepts together. The list of contributions, with links, is below. There are a handful of free access eprints to my introduction still available, but the rest of the articles are behind a paywall for now. If anyone wants me to email one or other of the papers just PM or leave a comment. Heaney, J.G. (2013) ‘Emotions and power: a bifocal prescription to cure theoretical myopia’, Journal of Political Power, 6(3), 355–362. Flam, H. (2013) ‘The transnational movement for Truth, Justice and Reconciliation as an emotional (rule) regime?’, Journal of Political Power, 6(3), 363–383. Simpson, A.V., Clegg, S.R., Freeder, D. (2013) ‘Compassion, power and organization’, Journal of Political Power, 6(3), 385–404. Barbalet, J., Qi, X. (2013) ‘The paradox of power: conceptions of power and the relations of reason and emotion in European and Chinese culture’, Journal of Political Power, 6(3), 405–418. Wettergren, Å., Jansson, A. (2013) ‘Emotions, power and space in the discourse of “People of the Real World”’, Journal of Political Power, 6(3), 419–439. Baker, S.A., Rowe, D. (2013) ‘The power of popular publicity: new social media and the affective dynamics of the sport racism scandal’, Journal of Political Power, 6(3), 441–460. Martin, J. (2013) ‘A feeling for democracy? Rhetoric, power and the emotions’, Journal of Political Power, 6(3), 461–476. Zembylas, M. (2013) ‘Memorial ceremonies in schools: analyzing the entanglement of emotions and power’, Journal of Political Power, 6(3), 477–493. Procter, L. (2013) ‘Emotions, power and schooling: the socialisation of “angry boys”’, Journal of Political Power, 6(3), 495–510. 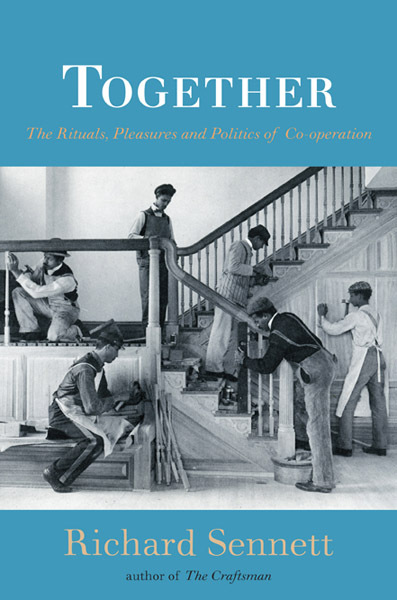 Here is a link to the audio of an RSA Keynote by Richard Sennett from February 2nd, 2012, in which he discusses his new book, Together: the rituals, pleasure and politics of cooperation (2012). This is the second volume of his “homo faber” trilogy, sitting between 2008’s The Craftsman and a future work on the urban environment and its co-construction. A Guardian review of the book is here. The RSA blurb is below. Living with people who differ – racially, ethnically, religiously, or economically – is one of the most difficult challenges facing us today. Though our society is becoming ever more complicated materially, we tend to avoid engaging with people unlike ourselves. Modern politics emphasizes unity and similarity, encouraging the politics of the tribe rather than of complexity. At the RSA, distinguished sociologist Richard Sennett explores why this has happened and what might be done about it, arguing that living with people unlike ourselves requires more than goodwill: it requires skill.